Coming off a recent sublime record-breaking run of 1:54.14 in the 800m at the recent SAA Track & Field Series #3, Zachary Ryan Devaraj was the firm favorite for the ‘A’ boys 800m division title at the 52nd National Inter School Track & Field Championships 2011. Well he didn’t disappoint as the 17-year-old led from start to finish. He lapped the first round with a split of around 57 seconds with such consummate ease. The final lap with no push, and any competitor near him, Zachary celebrated early by finger wagging to the stands at the 300 meter mark, much to the delight of the crowds. 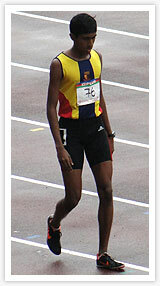 He reached the finish line in a new Championship record time of 1:57.10, eclipsing the old mark of 1:57.67 set by Subaish s/o Rajamanickam of Yishun Junior College dated 2002.